Come and join us for Koraalboom 2019, The course has been going through an incredible transformation over the past 5 years and unbelievably it just keeps on getting better and better. HJ and his team have again outdone themselves anf this years Koraalboom promises to be the best experience for everyone attending ever. The Format will continue on the same as last year with Singles on Thursday and Saturday, Betterball on Friday and a fun 4-Ball Aliance scramble drive competition on Sunday. Sunday was very well received last year and we would like to see you all there! If you haven't already please download the entry form on the website and get it in as soon as possible as there is limited space.There has been a small change to the entry fee as dinners will need to be ordered on the entry form. 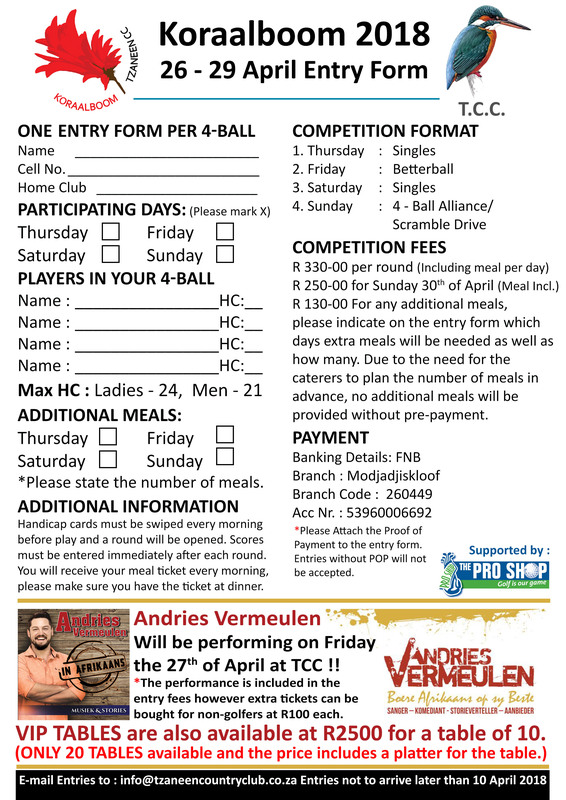 Please specify which days you will be attending dinner and that cost should be added to your entry fee. Fridays dinner is sponsored by NTT Toyota Tzaneen for the golfers, however any additional people attending will have to pay for their dinner and should be added to the entry form and paid for on entry of the competition. If you have any Queries please contact HJ. Come and join us for Koraalboom 2018, if you thought that the course was in magnificent condition last year you will be blown away by how it has kept on improving, HJ and his team have put in even more work than before and all we can say is seeing is believing. If you haven't already please download the entry form on the website and get it in as soon as possible as there is limited space. 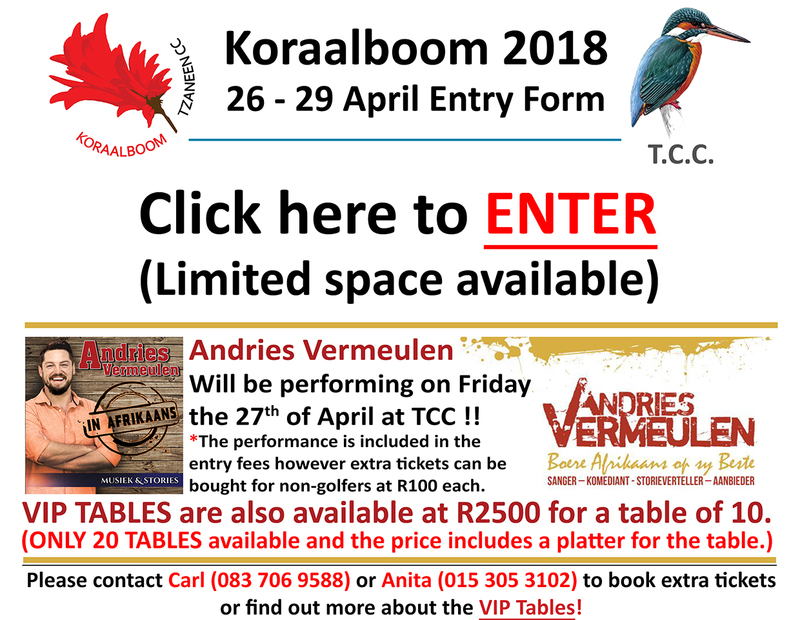 An add on this year is a performance on Saturday night from Andries Vermeulen is well known in South Africa and it promises to be an entertaining evening. The performance is included in the entry fees however non-golfers will have to buy extra tickets on the day at R100 each. There are also 10 Seater VIP tables available at R2500-00 pe table which includes a platter for 10 people.These tables will no dount be in high demand and as there are only 20 available book early to avoid dissapointment!! Join us for Koraalboom 2017, the course is in magnificent condition thanks to all the rain we have had over the past few months. The course is greener than ever and it promises to be in top condition for Koraalboom 2017 event. Although with all the growth the rough might play a big part in this years competition. If you haven't already please download the entry form on the website and get it in as soon as possible. Enter soon to avoid dissapointment. Congratulations to everyone who took part and braved the possibility of heavy rains! The committee members made a good call to continue on with the tournament and as it turned out the rain stayed away for the most of the weekend. 43 players took part and deserved winners were crowned in each division! The A-division winner and 2016 Club Champion, playing his first Club Champs at Tzaneen Country club was Marnus Nel with rounds of 75 & 70. The Ladies Club Champion was Willemien Roettgers who defended her title from 2015. In the B-Division the winner was Hendry Schoonraad and in the C-Division winner after a strong challenge on the final day was Marcelle Schipper, he won by a point with scores of 39 & 23 (that's right 23 points!). 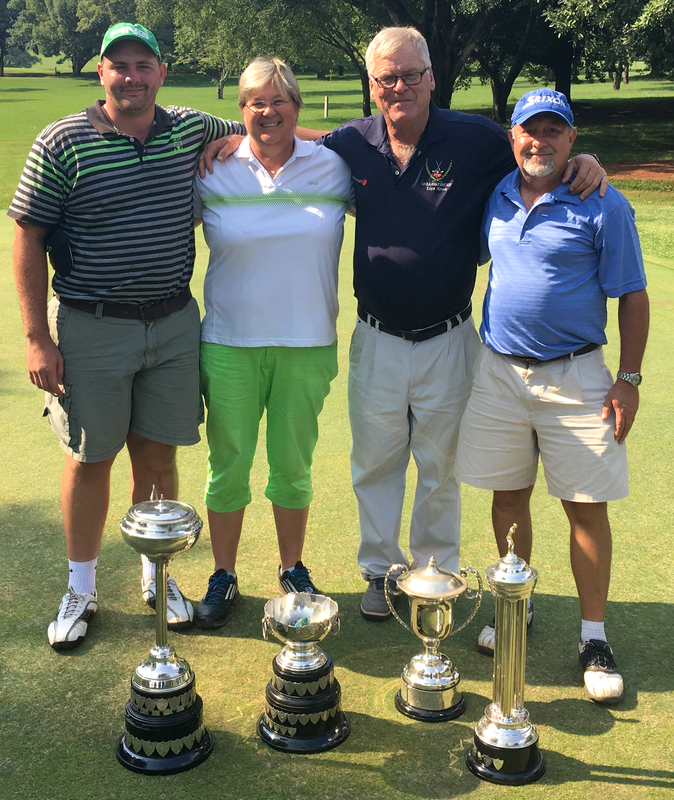 (From L to R) Marnus Nel (Club Champion), Willemien Roettgers(Ladies Champion), Marcelle Schipper (C-division winner) & Hendry Schoonraad (B-Division winner). 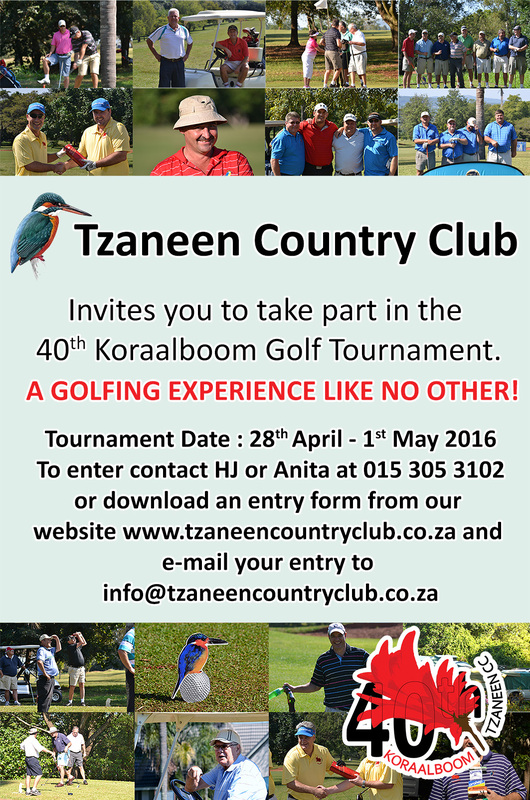 Koraalboom 2015 was the 39th time the tournament has been played at Tzaneen Country Club and was again sponsored by FNB. The tournament was another huge success with 118 players in the Saturday field. 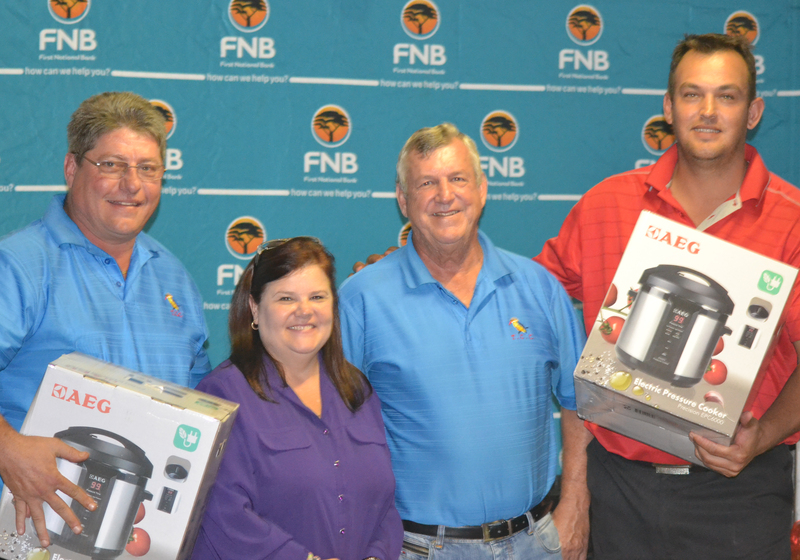 (From L to R) Dawie van Vuuren (Thursday B/B Winner),Erika De Jager (Sponsor - FNB), Jan van Jaarsveld (Club Captain) & Piet Mostert(Thursday B/B Winner). Copyright �� 2009 GMS Design. All Rights Reserved.